Hypothyroidism is a condition where the thyroid does not make enough hormones. The most severe form of hypothyroidism is called myxedema. It is a medical emergency. Treatment of hyperthyroidism can lead to hypothyroidism. Some medications can cause it. It can be caused by disease of the thyroid gland. It can be caused by the pituitary gland not working right. (The thyroid needs the pituitary gland to help it work correctly). It can be caused by congenital defects (problems with a baby's growth and development before birth). Removal of the thyroid gland can cause it. Some women get it during pregnancy. Risk factors include being over age 50. Females are at high risk. Those who have had thyroid surgery are at risk. People exposed to neck x-rays and radiation treatment are at risk. Women with diabetes are at risk of getting it during or after pregnancy. Symptoms may be hard to notice and are similar to symptoms of depression. Symptoms can be mild to severe. Infants and young children may have developmental disabilities. Infants may have trouble feeding, swollen stomachs, or not grow normally. The body slows down, both physically and mentally. Newborns are tested for it right after birth so treatment can begin immediately. The doctor may take several tests to see if there is a thyroid problem. The goal of treatment is to help the thyroid start working correctly. Treatment may include thyroid hormone medication. Your child should have check-ups if she has hypothyroidism. Your child will probably have to take thyroid hormones for the rest of her life. If left untreated, symptoms are likely to get worse. A child with hypothyroidism will need medication her whole life to prevent problems. Call the doctor if your child has symptoms of hypothyroidism. Call the doctor if symptoms do not get better with treatment. Call the doctor if your child gets new symptoms. Call the doctor if your child has chest pain, a very fast heartbeat, or difficulty breathing. Treatment of hyperthyroidism can lead to hypothyroidism. Some medications can cause it. 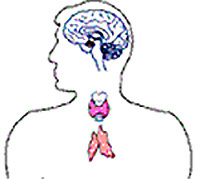 It can be caused by disease of the thyroid gland. Risk factors include being female, over age 50, and being obese. Symptoms may be hard to notice and are similar to symptoms of depression.